Clothing designs seem to be constantly changing, so the fashion industry must keep up with the trends of today while predicting the designs of tomorrow. Fashion and textile designer Jhane Barnes demonstrates how she incorporates mathematics into her creations, and a fashion buyer explains how math is used to describe fashion trends. •Recognize the applications of geometric elements in fabric and clothing design. 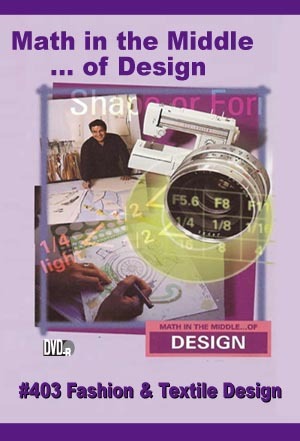 •Explore the use of computer software and mathematical relationships in the generation of designs for textiles. •Appreciate the geometric elements that have been used in the creation of tapestries, flags, quilts, and weavings.